What about Franz Beckenbauer for Germany... these are the two favorites... what about others? Mohamed Salah (Egypt) has some pretty hot cards out there. I really like the background of his 2018 Panini National Landmarks card. Like that card! Hope that he plays tomorrow against Uruguay! Absolutely a tie at this point... I am rooting for Messi to win this one! It would be nice if Messi could take away the one thing people can say against him, no World Cups. Of course it's a very tall order. Last edited by rgpete; 06-15-2018 at 02:31 PM. Such a well designed card. The subtle lines at the bottom makes it look like Messi is dribbling right at you. Perfect pose for the perfect player. One could argue with Platini. 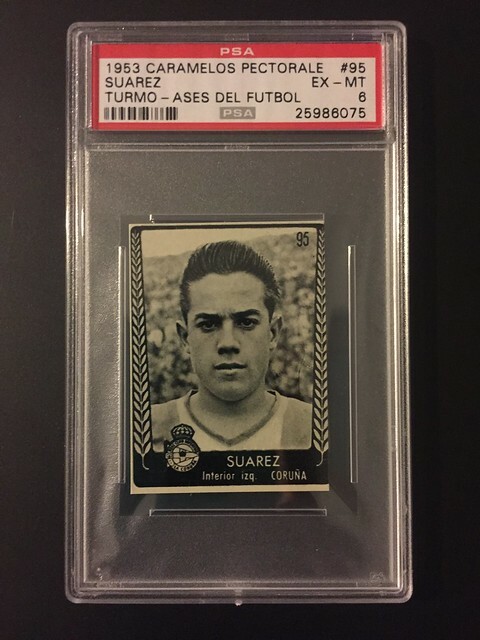 That is an insane grade on that card. Last edited by Peter_Spaeth; 06-15-2018 at 10:50 PM. Last edited by rgpete; 06-16-2018 at 06:41 AM. No question. And yes, bought it raw and quite happy with the result! Not a vintage card or even that expensive of a card but just bought the 2016 Corentin Jean / Kylian Mbappe Panini rookie from a European website for $0.35. I havent been able to find any Mbappe card that pre-dates 2016 or even another one from 2016, so I am assuming it is his only true rookie card. Please let me know if I am wrong and would someone please explain an easy way to post pictures on here. Nice buy. Yup that’s his first issue.